A zombie walk is an organized public gathering of two or more people who dress up in zombie costumes. Usually taking place in an urban centre, the participants make their way around the city streets and through shopping malls in a somewhat orderly fashion and often limping and gnawing their way towards a local cemetery. This episode is work safe. 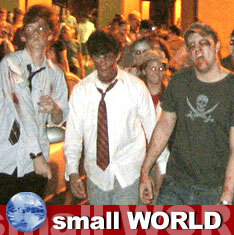 Interview with Adam and Tommy, organizers of Zombie Day zombie walk. We discuss what a zombie walk is; Torontoâ€™s zombie walk; flash mobs; how they got into zombie walks; what makes for a good looking zombie; how people reacted to their zombie walk; George Romeroâ€™s Night of the Living Dead; â€˜Zombiesâ€™ arrested in downtown Minneapolis; their forthcoming Zombie Day documentary; why they decided to make a documentary about their zombie walk; my interview with Kim Paffenroth, author of Gospel of the Living Dead and my interview with Robert Sacchetto of Zombie Portraits; why are we so fascinated with zombies; our favorite zombie movies; how we will be spending the holidays. Featured song is "Blind Faith" by Melissa Kate.